Proper payment for vaccines is dependent on good coding practices. Selecting an incorrect code for a vaccine product can lead to payments that are less than you acquisition cost for the vaccine. In the following example a 40 year old patient with private insurance is visiting her providers for a re evaluation of her asthma and to get some prescription refills approved. At that visit it is recommended that she receive both an influenza and pneumococcal vaccine. First the level of the office visit must be evaluated based on the criteria that have been defined in the CPT manual. This patient is an existing (not new) patient for the practice and based on the length of the visit and the documentation in the patient’s medical record it was determined that the proper code for the visit was 99212 and it is inserted on line 1, Box D.
The Centers for Medicare and Medicaid Services (CMS) developed the National Correct Coding Initiative (NCCI) to promote national correct coding methodologies and to control improper coding leading to inappropriate payment in Part B claims. The CMS developed its coding policies based on coding conventions defined in the American Medical Association’s CPT Manual, national and local policies and edits, coding guidelines developed by national societies, analysis of standard medical and surgical practices, and a review of current coding practices. Information on these edits can be found here. These edits indicate that a vaccine administration and an office visit are unlikely to occur at the same time. To overcome this edit and get paid for both the office visit and the vaccine administration, a modifier 25 must be attached to the CPT code for the office visit. The modifier is inserted into Box 24 D next to the CPT code for the office visit. CMS has realized that the edit on office visits when a vaccine was administered has created some difficulties for providers and has allowed Medicaid agencies to disregard this edit. A provider should contact the state Medicaid agency or Medicaid Managed Care organization to determine whether or not a modifier 25 is required to receive payment for the office visit when a vaccine administration fee appears on the same claim. Some Medicare Administrative contractors are requiring the use of modifier 25 on fee for service Medicare claims. Medicare Managed Care organizations and commercial payers may also be applying this edit. It is suggested that if an office visit is denied when a vaccine administration fee is on the same claim that you contact the specific payer to determine the payer’s requirements around the application of modifier 25. Each code that appears on the claim form must be supported by a diagnosis code that is noted in Box 21. The number appearing in Box 24 E (Diagnosis Pointer) indicates which diagnosis code (appearing in Box 21) applies to the CPT code on that line. For the patient in this scenario, the provider would choose the ICD10 code that best describes the patient’s asthma condition. While the transition to ICD 10 is going well, providers should check with their specific payers as to where the payer is in the transition process. In Box G, the provider must indicate where the service was provided. In this scenario, the “1” indicates that the services were provided in an office setting. A list of the place of service codes can be found here. 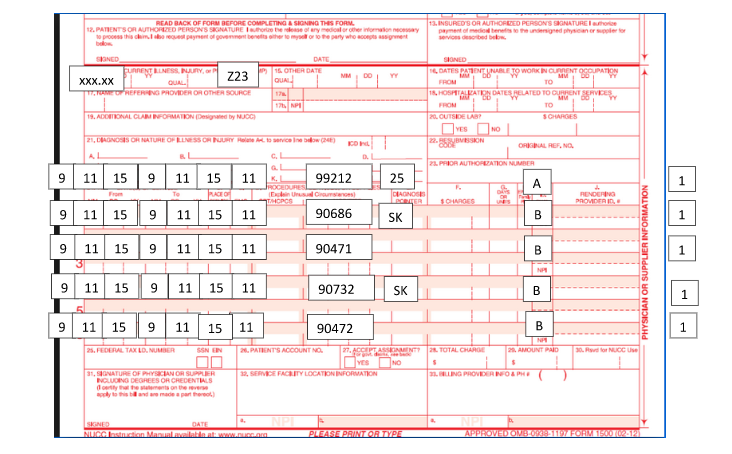 A place of service code must appear for all the services indicated on the claim form. On line 2, Box D, the CPT coded describing a quadravalent, preservative free influenza vaccine is inserted. Since this patient could be considered high risk based on their asthmatic condition, the provider should consider applying the ‘SK” modifier to the code for the vaccine product. According to ICD 10, all vaccines that are provided to prevent a disease are coded with Z23 and this code is listed as diagnosis code B in Box 21 and attached to the CPT code for the vaccine product. Each vaccine that is provided should also be connected to a vaccine administration fee. The vaccine administration codes that include a counseling component (90460-90461) are aged based. Since this patient is over 18 years of age, vaccine administration coded 90471 should be inserted in Line 3. The diagnosis code links the vaccine product and the vaccine administration and Z23 is the appropriate code for the vaccine administration. On line 4, the CPT code describing a pneumococcal polysaccharide vaccine is inserted. Again the use of an SK modifier indicating this is a high risk patient should be considered. Since Z23 is the appropriate ICD 10 code for all preventive vaccines, this diagnosis code should be attached to the code for the pneumococcal vaccine and its administration. A 40 year old patient with private insurance is seen at the provider’s office for the evaluation of her asthmatic condition and related prescription refills. The physician recommends and administers a quadravealent, perservative free influenza vaccine and a pneumococcal polysaccharide vaccine. Box 21. Diagnosis code A. Should reflect the ICD 10 code describing the reason for the office visit. In this case the patient’s asthmatic condition. Box B. Should reflext the location where the service is provided. In this example 11 indicates the service was provided at an office. Box D. Procedures, Services, or Supplies. NCCI edits require a modifier 25 to recognize the office visit as a distinct service from the vaccine administration. The SK modifier can be used to indicate that the patient is considered high risk. Box F. Charges. Should reflext the HCP’s usual and customary charges. The report of the vaccines National Drug Code (NDC) may be required by some payers including Medicaid and TriCARE.